Make your New Year’s Eve (or any party) special by peppering it with easy Champagne Cocktails. I’ve come up with six champagne cocktails that together only use nine ingredients. You can get everything ready to make all of these drinks with little fuss before the party. And once the party begins, let everyone mix away. Grenadine (a sweet red syrup sold in most grocery stores. Mine is sold near the wine section. In our old Toronto grocery store it was sold near the bottled water where there was a selection of syrups for adding to drinks). And of course, some sparkling wine. No need to spend a truckload on fancy stuff. Nice bottles of the Italian version of Champagne, called Prosecco (around $12/bottle), or the Spanish version, called Cava (sometimes as low as $10), or even some dry bubbly from California or Australia will work. My Advice: Go now and buy a bottle of what you think you’d like to have at your party. Chill it really really well and then try it. For the cocktails you want something dry, not sweet. But it’s o.k. if it has some background fruit flavors. Most importantly, make sure that you like it. If you do, then you’ll like your cocktails too. This drink is just a little twist on the classic Mimosa. You've still got your orange and bubbly in there, but there's also some extra sweetness (and redness!) from the grenadine and a bit of puckering lemon to balance it out. 1/3 of a cup of fresh squeezed orange juice (or store-bought "Not From Concentrate" OJ, best to get the kind without pulp). Pour the sparkling wine into a port glass or a small wine glass. Add the orange juice and then the grenadine and the lemon. The grenadine likes to go sailing down to the bottom of the drink making for a nice striping-sunset effect. But the result is an overly sour drink. Serve it with a stir stick so that people will know to stir the red sweetness up from the bottom to balance out the lemon. 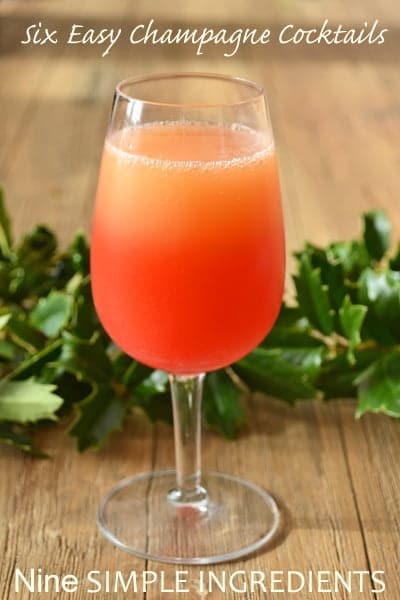 I’ve started with this cocktail because it is also great for a festive brunch. You can totally serve it in the evening at your New Year’s Party but it will work just as well if you’re having friends over the next morning or anytime during the holidays. 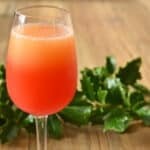 I love this twist on the usual Mimosa. In fact, I think I’m going to paint all my Mimosas red from now on! Great idea! The simplest cocktails are often the best, in my opinion. This sounds tasty, and looks quite fetive! Thanks Lauren! I agree completely. The most simple things are usually the best things. I hope you have a very Happy New Year!